Our 1948 Rolls Royce Silver Wraith is a refined, romantic and elegant car. The coach work is finished in Old English White and Black and trimmed with ivory leather interior. The interior is extremely spacious with wide rear doors for easy access and occasional seats to increase the seating capacity to six if required. For privacy the rear carriage can be separated from the chauffeur by an electronically operated glass division. 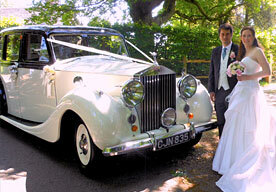 Our open top classic tourer - perfect for summer brides. 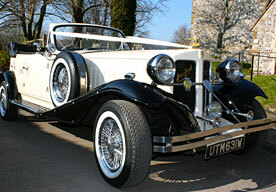 Our Beauford Tourer convertible is finished with Old English White and Black coachwork with ivory leather interior. Complete with its own silver champagne cooler to ensure you arrive in style. A popular choice for brides and bridesmaids. Seats up to seven passengers plus the chauffeur. 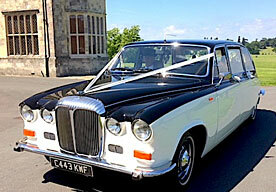 All our wedding cars are finished with ivory and black coachwork. We are happy to offer discounts if more than one vehicle is required.